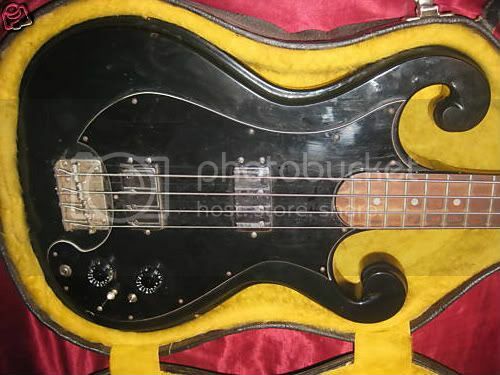 We've already looked at the Epiphone Scroll Guitar on this blog (there's one for sale on eBay right now - if I hadn't just lost my job I'd snap it up straight away) and here's its bass counterpart also from the 1970s, the Epiphone Double Scroll bass, featuring - as the name suggests - scrolls on both horns. She sure is a beauty! Look at this... The thieving b*st*rds! Can you help identify this guitar?